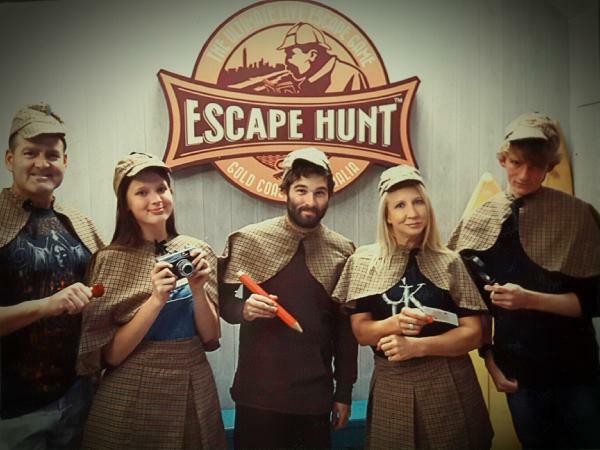 Spend an exhilarating 60 minutes locked in a room with 4 friends, trying to escape with all the clues to a crime. Sound simple? Give it a try! The Escape Hunt is a unique experience, with one of three different crime adventures to untangle. Work as a team to race against the clock, solve your mystery, and find the guilty suspect. Anyone can play, family of all ages, colleagues and friends. Anyone who enjoys a good puzzle! A Timely Escape (Difficulty 3/5) - It’s 1965 and you are detectives framed for the murder of an avid watch collector and the theft of his precious golden fob watch. While in prison awaiting your trial, you learn that innocent prisoners have been disappearing. You only have one hour to break out of your cell, investigate the mystery of the disappearing prisoners and find the necessary evidence to clear your names. Murder in the Cellar (Difficulty 4/5) - The owner of a prominent Gold Coast Hinterland vineyard has been mysteriously murdered on his property. Rumour has it that he had been involved in some suspicious business dealings. The police need your help to solve the case in the next 60 minutes before news of murder leaks to the press. The Lost Weapon (Difficulty 4.5/5) - Mysterious cryptic messages kept appearing in James Ricker’s house and he had approached you to help him decipher these messages. However, three days later he was found dead. Were there any connections between the cryptic messages and his murder? Can you help solve this murder case and find the murder weapon in 60 minutes? Solve the crime and find a surprise waiting for you after your game! I took my family to check it out and it was fantastic. We actually spent a whole hour talking and interacting with each other....and not one mobile phone in sight! Loads of fun, kept us busy for the entire time. Very cryptic - clever! Your message has been sent to Escape Hunt - Room Escape Challenge - Southport. You should hear from them shortly. Please note: all responses will come directly from Escape Hunt - Room Escape Challenge - Southport, and not the team at Bookme.